20 Week Programme – Thursdays 10am – 1pm. The NCCWN and the Women’s Community Projects Mullingar have been awarded funding under the Programme for Employability, Inclusion & Learning (PEIL) 2014-2020 through the Dept. 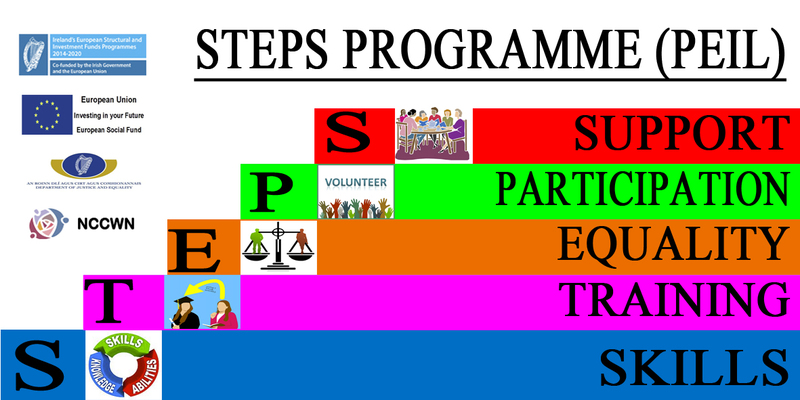 of Justice & Equality, to develop and deliver a 20 Week STEPS for Women Programme. The exciting new programme will offer a comprehensive range of supports and skills for women wanting to return to work, return to education or simply find a new direction in their lives. The Course will support women to identify existing skills and qualities and how to build on these as well as offering practical skills in areas of IT, social media, communications, interview and presentation skills. The course is free of charge and open to women not on the live register and not currently in receipt of unemployment benefit. Women in receipt of disability payments, one parent family payments, carers allowance etc are eligible for the course. The course will run on Thursday mornings 10am – 1pm, for 20 weeks. For Further information on when our next ‘PEIL Steps Programme’ contact Valerie on 044-9334827 / Maureen on 044-9344301 or email: coordinator@wcpmullingar.ie / adult.ed@wcpmullingar.ie. Or alternatively please fill out and submit the “CONTACT FORM” below.